Museum Square (Museumplein) is a public space in Amsterdam. 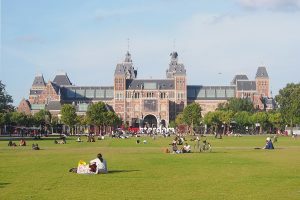 Three major museums are located here, the Rijksmuseum, the Van Gogh Museum and the Stedelijk museum. There is also a concert hall located called “Concertgebouw”. In the Rijksmuseum you can find al the beautiful art pieces of Rembrandt, Vermeer and Hals. This museum is based on all the riches of Amsterdam and is a must see museum when visiting Holland. Some of the most famous paintings are seen here, like the ‘Nachtwacht’ of Rembrandt and many more. The Van Gogh museum is a dedicated museum to the famous Dutch painter Vincent van Gogh in Museum Square. The collection contains more than 200 paintings, 500 drawings and 700 letters drawn and written by Vincent van Gogh. Unravel the story of Vincent van Gogh and pay this beautiful museum a visit. Also The Stedelijk museum is must visit for modern art lovers! In this museum you can find famous modern and contemporary art and design. In this museum you can find art pieces from artist like Pablo Picasso, Yves Klein and Roy Lichtenstein. The square is also used for big events such as festivals, celebrations or for watching important football matches on big screens.